April has been mostly wet and chilly, with some days of sun. But everything perennial that I planted last year is coming up and looking okay! 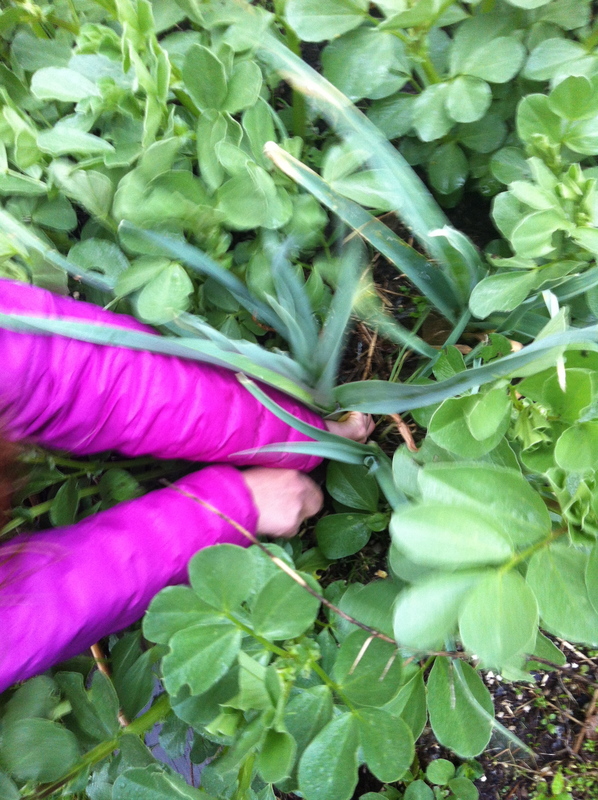 Ive started planting some things directly in the ground, since as of April 24th we are past the frost date. 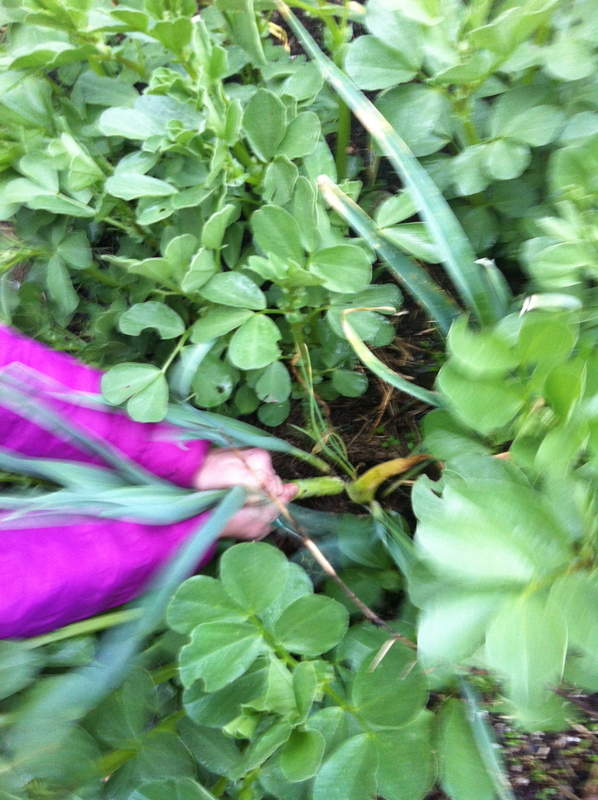 Here’s a snapshot of what’s happening in my garden. 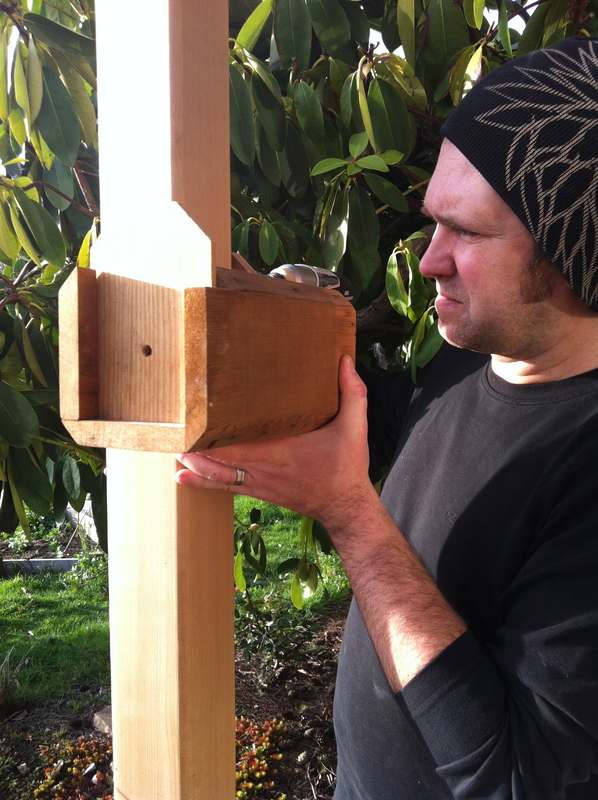 In late March we put in the mason bee stand. it faces south (though I wish there weren’t so many obstructions so we could get it to have some morning sun, which the bees need to fly). Working on taking out the grass. 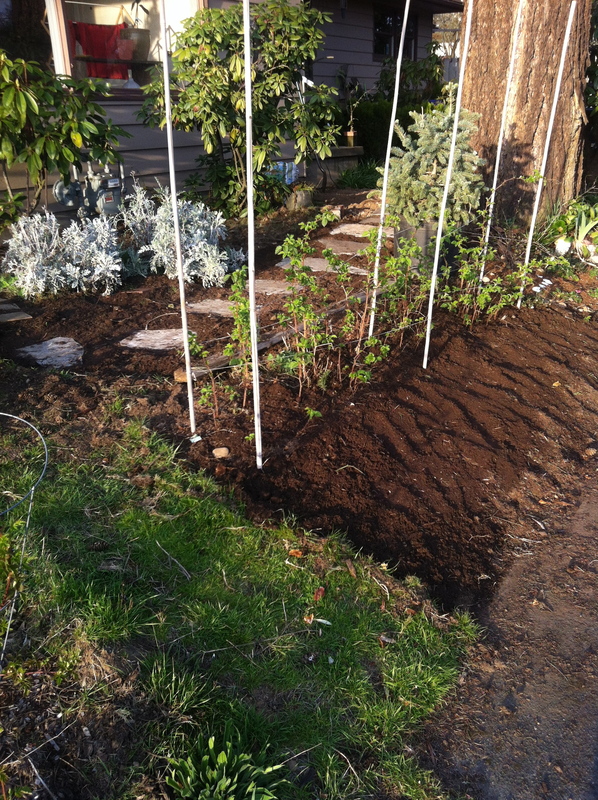 Here’s stage one – along the raspberries. Took a huge amount of effort. 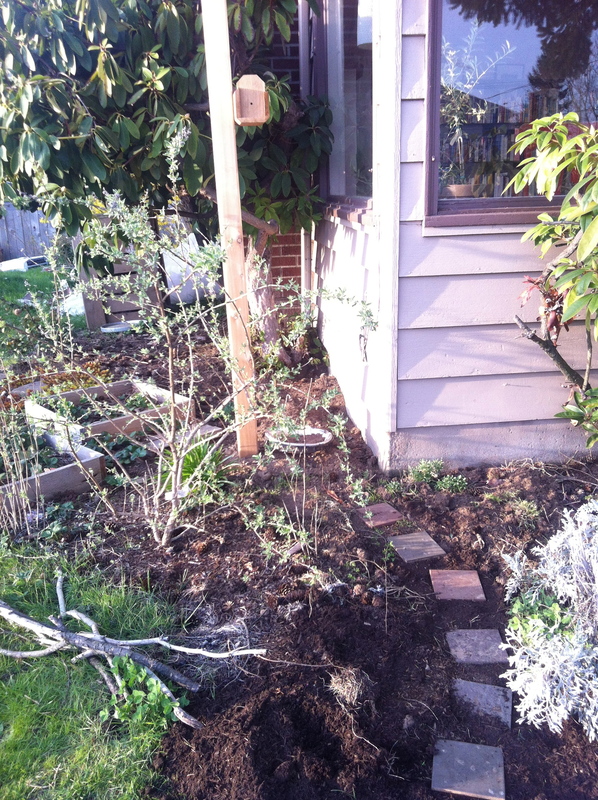 I know I could sheet mulch, but I didn’t want the elevated ground, nor did I have enough soil and mulch. 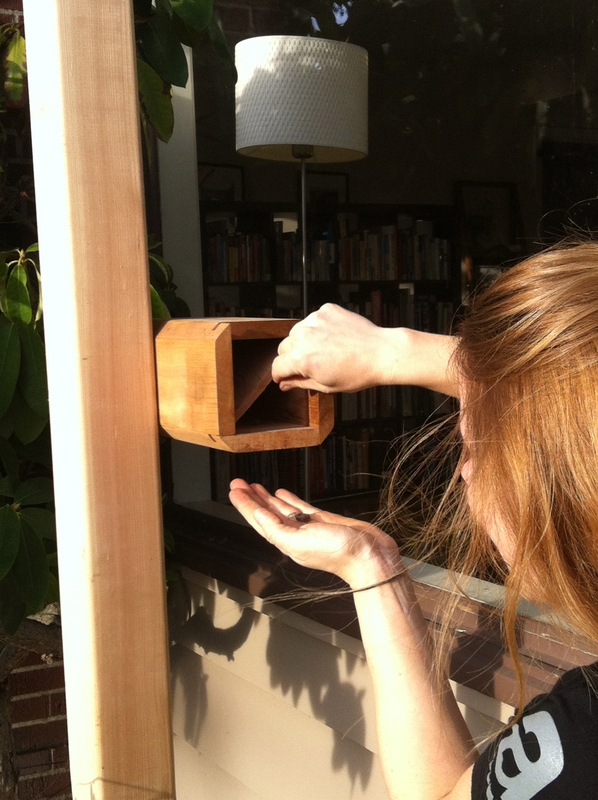 I also added a little path to the mason bee post. …rrrip! 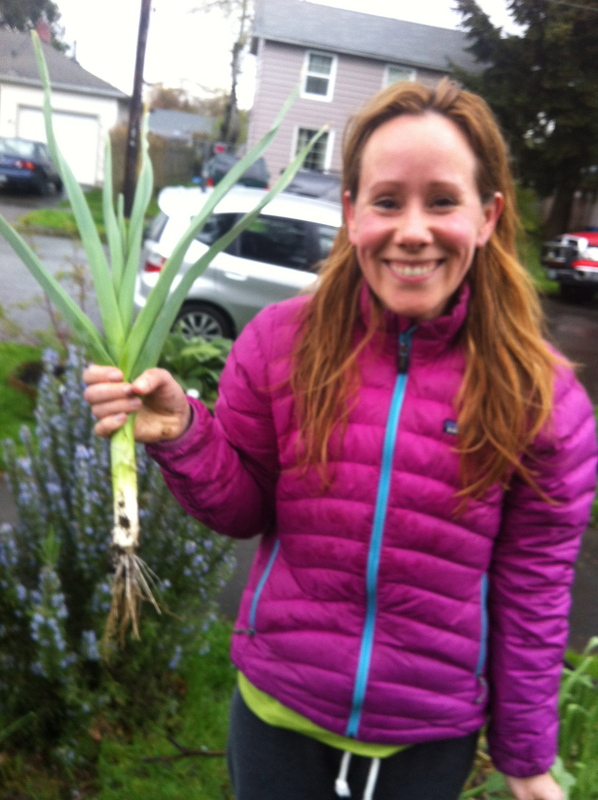 Leek! planted by seed LAST YEAR (gee whiz). The pears are flowering nicely! 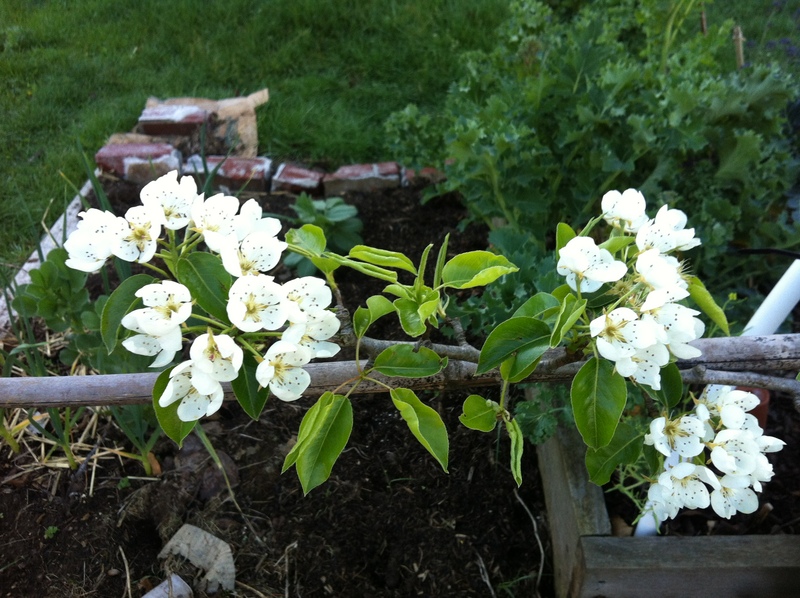 As of today (last day of April) the flowers are mostly gone and some mini pears are showing. Hopefully they got fertilized. 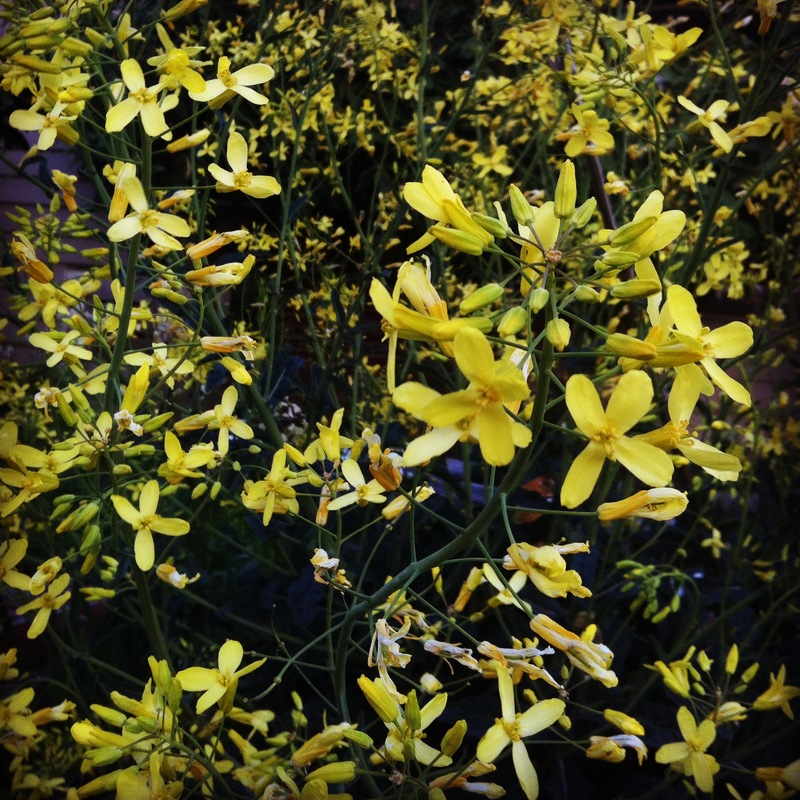 Okay, the early April garden is all about the color yellow. 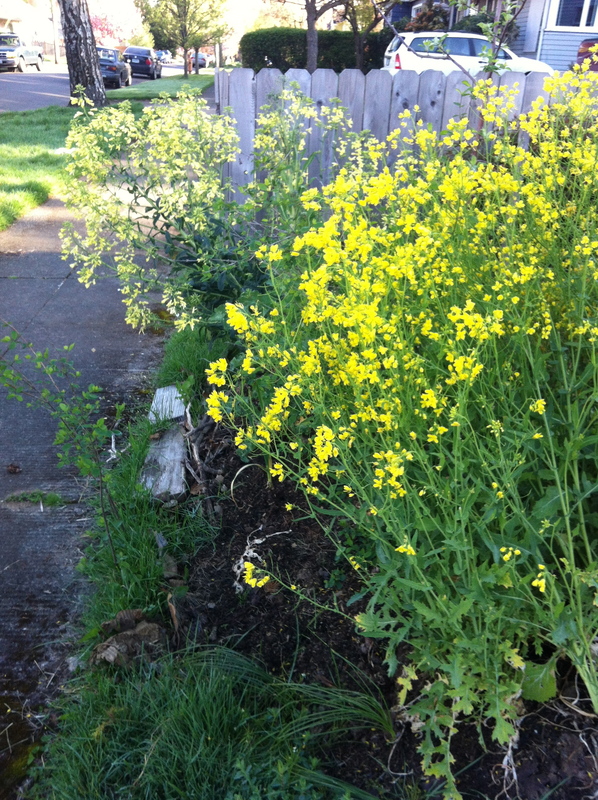 Yellow kale flowers (back), yellow broccoli flowers (front), yellow watercress flowers not in picture. So gorgeous. Only thing about these flowers are they are NOT something you put into a vase. I made that mistake and my bedside smelled like rotten eggs by the next day. 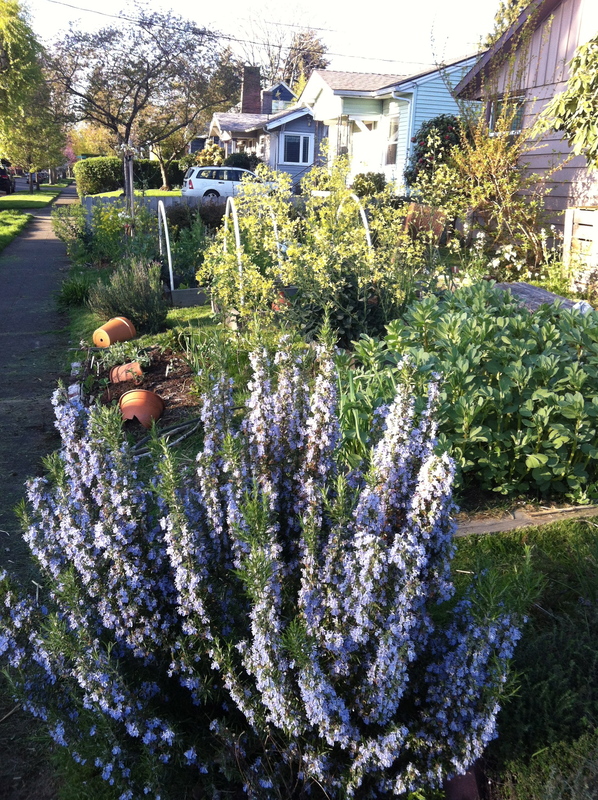 Side yard parking strip – trying to make it have alot of native. 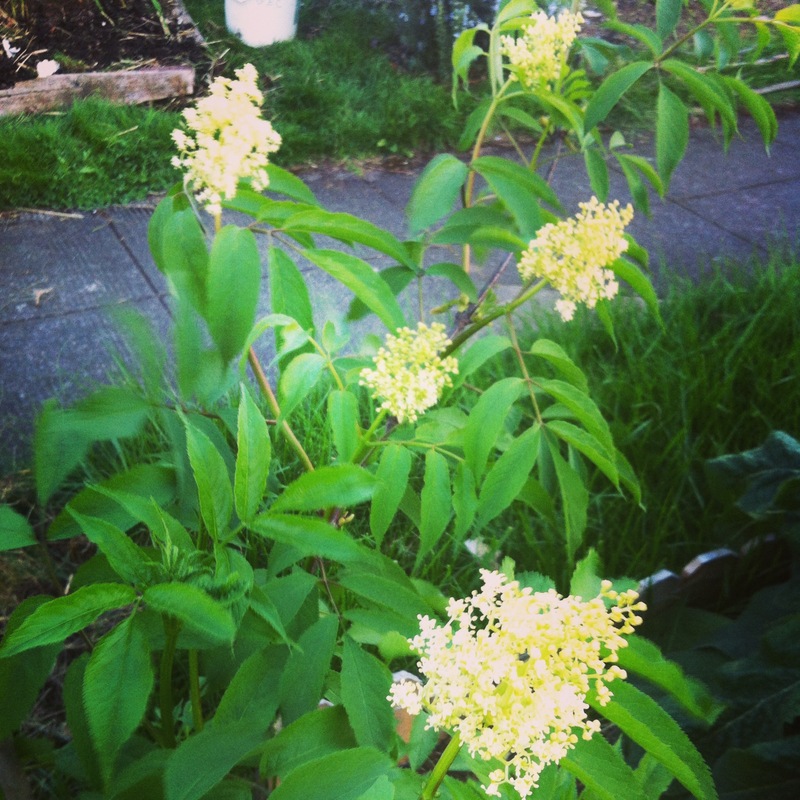 Here are the red elderberry blossoms, early April. As of today (last day of April) the petals are gone and it doesn’t look like there are many berries forming. Birds? 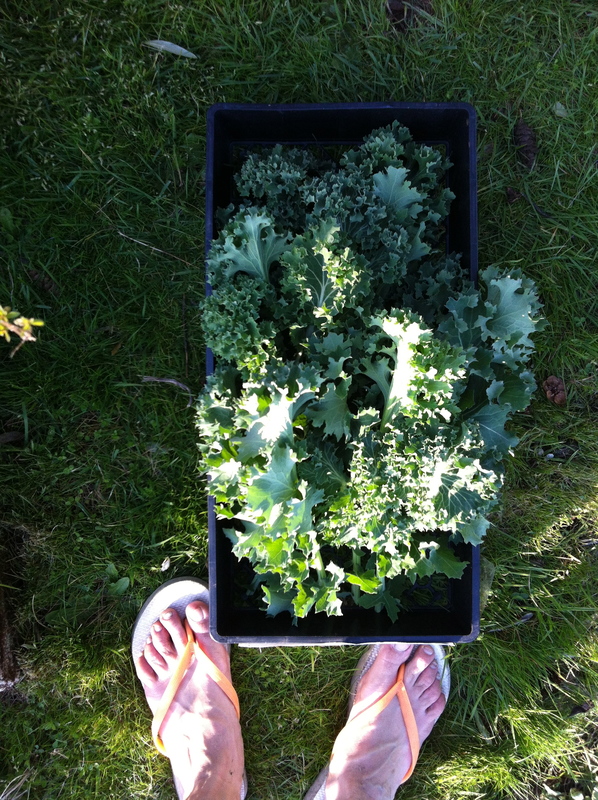 I harvested bunches of curly kale from my fall-winter-spring plant and harvest. I blanched it and froze it. Will be a nice treat at some point. 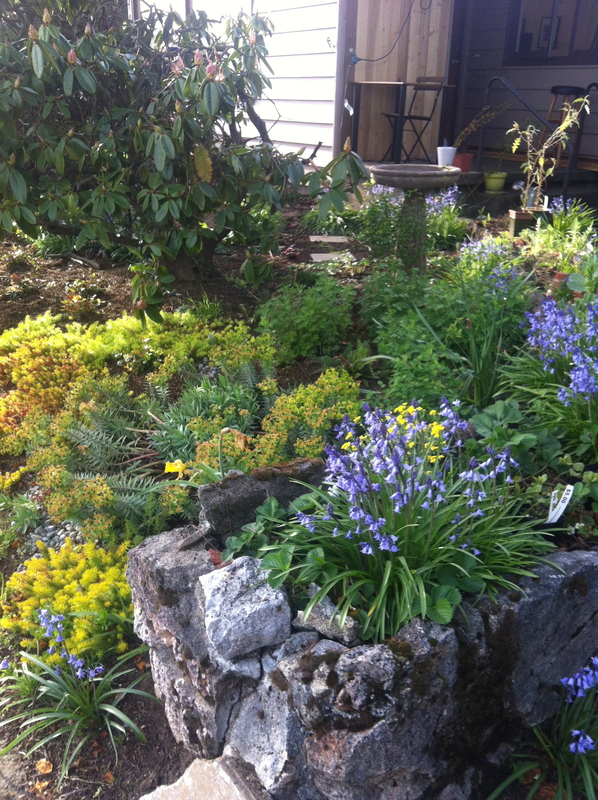 …and yellow and purple spring colors at the front (native, mostly) side of the house.